The United States has had many conflicts and wars within its borders and without. Many have studied and researched the American Revolution, the Civil War, World Wars I & II, Korea, Vietnam, and now Iraq and Afghanistan. While that research is invaluable, there are many others that should not be forgotten. 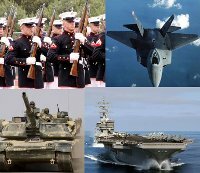 This site covers all of the conflicts and wars that we could research. The set up for this site is probably different than any other military site you've seen before. Each state/territory has it's own pages with the applicable conflicts, wars and battles, as well as roster and muster rolls where appropriate. During the World Wars hundreds of thousands of Americans of foreign birth were interned in camps across the United States. Most lost everything they owned during this period. If you have more information or find a broken link, please let Billie Walsh know. You are the visitor to this site since 7 May 2010. Thank you for stopping by. Come back soon!